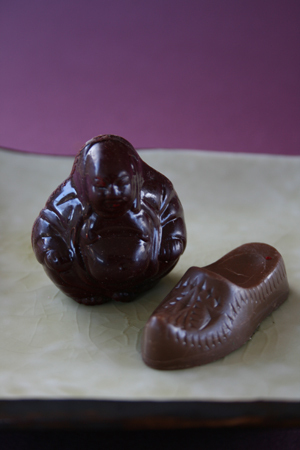 Belgian-style chocolates use molds in every design from the secular (shoe) to the sacred (Buddha). All photography by Hannah Kaminsky | THE NIBBLE. WHAT IT IS: Artisan chocolates in Belgian-style molds. WHY IT’S DIFFERENT: Made by a French expatriate in California. WHY WE LOVE IT: Fun shapes, sophisticated centers. WHERE TO BUY IT: ChocoCaliBressan.com. CAPSULE REPORT: The chocolates of Jean-Michel Carre are well worth a taste. This Frenchman has brought his European schooling and years of international culinary experience to Carpinteria, California, a small oceanside community in Santa Barbara County. Now, lucky townspeople and beach visitors can partake in eating fine chocolate as well as enjoying great weather. See the full review below. This is Page 3 of a five-page review of artisan chocolatiers. Click on the black links below to visit other pages. “Bressan” refers to a person from the city of Bresse. Bresse is an area in Burgundy between the Ain and Saône rivers. Along with the city of Bresse, several towns in France have “Bresse” as part of their names (Beaurepaire-en-Bresse and Bresse-sur-Grosne, for example). Bresse is known in culinary circles for its outstanding chickens, the poulet de bresse. And you may remember it for the Chocolats du CaliBressan. For chocolatier Jean-Michel Carre, one-half of the driving force of Chocolats du CaliBressan, asking him not to work with food would be like asking him not to breathe. He started making chocolate at a very young age, assisting his mother as she rolled chocolate truffles in her kitchen in Bresse. Jean-Michel attended culinary school beginning at the tender age of 15 (which is the typical age of entry to European culinary programs). Upon graduation, he worked in Switzerland, the U.K., and finally, California, where he met Jill-Marie, his wife. Jill-Marie had worked in the food and beverage industry for many years, and she would become the other half of the soul of this business. The name, CaliBressan, merges their backgrounds, California and Bresse. 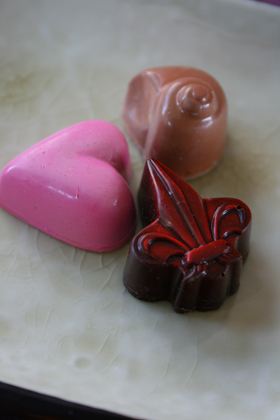 Belgian chocolates are characterized by molds in fanciful shapes. There are some unusual pieces in this collection, like the Geranium (flavored with geranium essence) and the Pain d’Epices: orange zest and spice-flavored milk chocolate ganache on top of a piece of gingerbread, covered with dark chocolate. But the Carres understand that there’s nothing wrong with more conventional chocolates that are brilliantly executed. Take their Champagne Truffle. A lot of people make champagne truffles, but very few get them right. Here, the ganache is of a perfect consistency, and, while you can taste the Champagne (and it’s the real thing), it doesn’t overwhelm the chocolate. The puckish bonbon called French Bisous (kisses) is shaped like a pair of lips, and the exterior is a bright red, thanks to colored white chocolate (see it in the photo, below). Inside, a tangerine liqueur blends beautifully with a dark and milk chocolate ganache. And even if you don’t have a shoe fetish, you’ll like the Bressan, a clog-shaped milk chocolate and praline piece flavored with nutmeg. Amusing shapes, intriguing flavor combinations and good ingredients; what’s not to love? If you’re passing through Santa Barbara County, the shop is located at 4193 Carpinteria Avenue, Carpinteria, California 93013. Hours are Monday through Friday, 10 a.m. to 6:30 p.m. and Saturday 10 a.m. to 5:30 p.m.
*Prices and product availability are verified at publication but are subject to change. Shipping is additional. These items are offered by a third party and THE NIBBLE has no relationship with them. Purchase information is provided as a reader convenience. 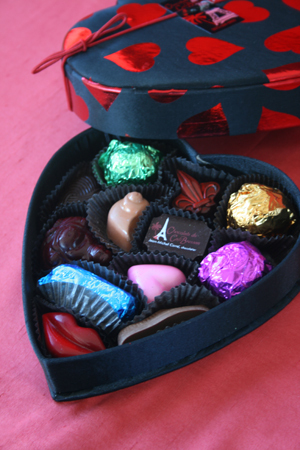 We got these for Valentine’s Day; the year-round box is black with red ribbon.